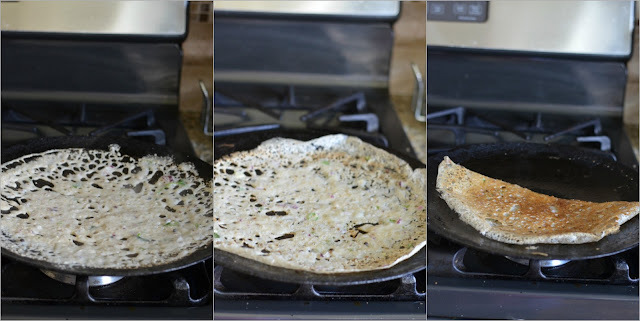 Today's recipe is a simple yet healthy dosa made with oats.This dosa resembles rava dosa and can be made in no time.As we like rava dosa,once in a while I make this oats dosa for our dinner or week end brunch. Coming to the recipe,I used some rice flour to get nice crispy dosa.If you feel the amount of rice flour is more it can be reduced.Also the consistency of the batter is so important to get a perfect dosa.This dosa needs some time to cook and gets crispy. 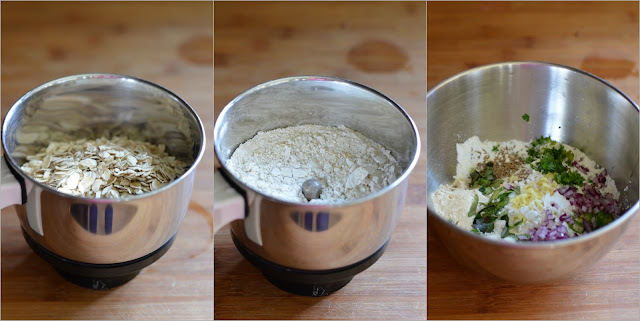 Powder the oats in a blender to a fine powder.In a bowl take all the ingredients except oil and oil. 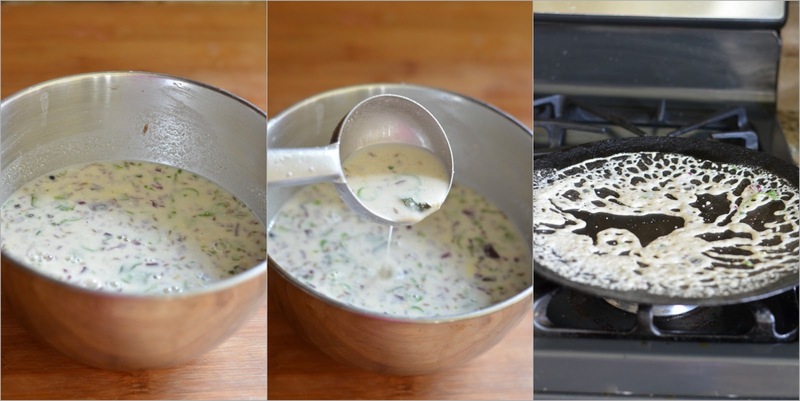 Mix it well with water with no lumps.The consistency of the batter should be thin like rava dosa.Heat a griddle and one it becomes hot ,add a drop of oil and wipe it off with a paper and keep the flame in medium.Pour a ladleful of batter in a circular motion from outside to inside. Fill the gaps with the batter.Increase the flame and cook it for a minute.Now drizzle a tsp of oil and cook it till the edges turn brown.Reduce the flame and let the dosa gets crisp, remove it from the pan. If needed flip it and cook it for 30 seconds and remove it. The batter can be stored in the refrigerator for a day. Oats dosa looks very crisp and has got a nice lacy finish. Love the lacy effect on the dosa. 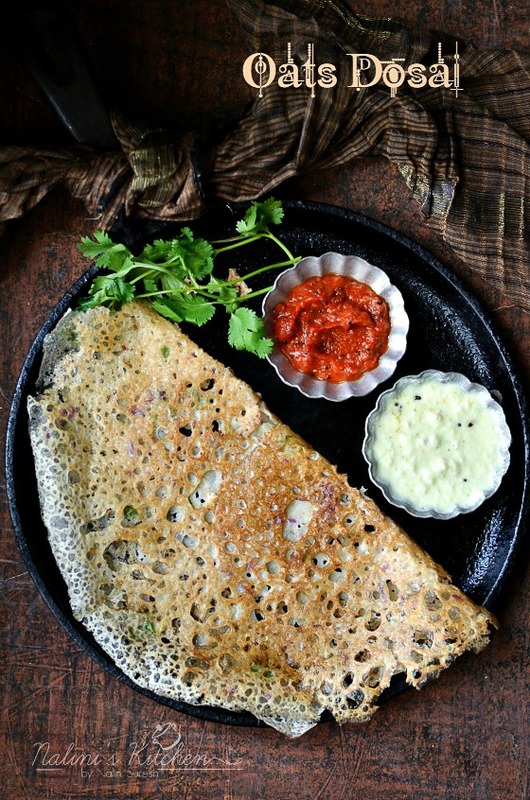 Looks so delicious..
Wow lacy oats dosa, thats seriously something different, well done Nalini. wow love that laces and the crispy dosa. Man you got to open a dosa shop. It looks lacey and crispy as rava dosa. Love the clicks. 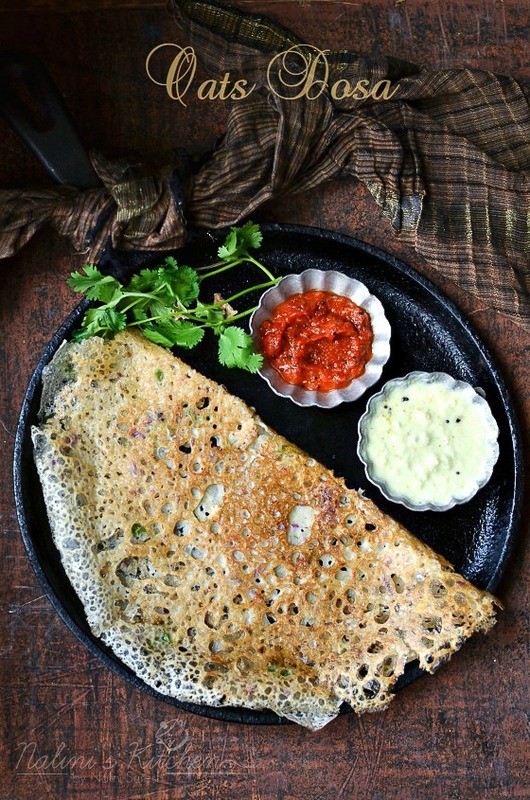 Love the lacy look of this oats dosa. Awesome clicks. perfect pretty looking dosa ..my hubby will go crazy eating this one..Nalini seriously I am enjoying the dosas a lot..all the recipes are fantastic. 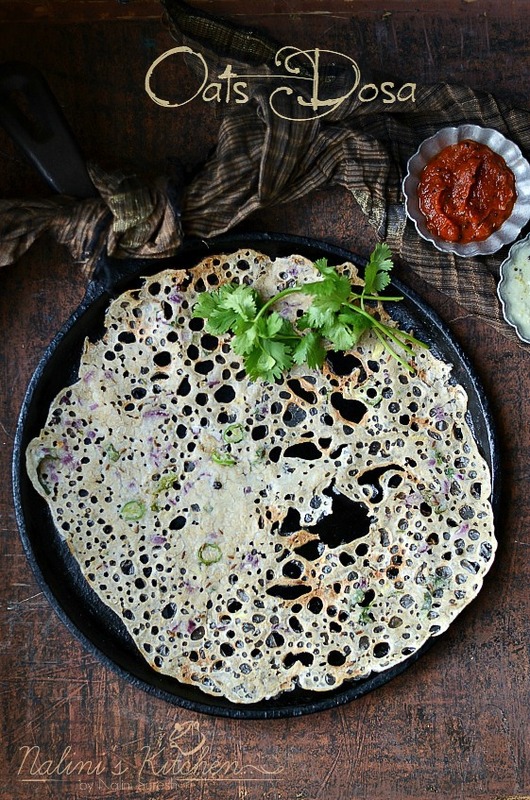 Our fav instant dosa ! Make it exactly the same way, except not to add onions for Amma separately :)) these are so crispy & sooooooo tempting ! 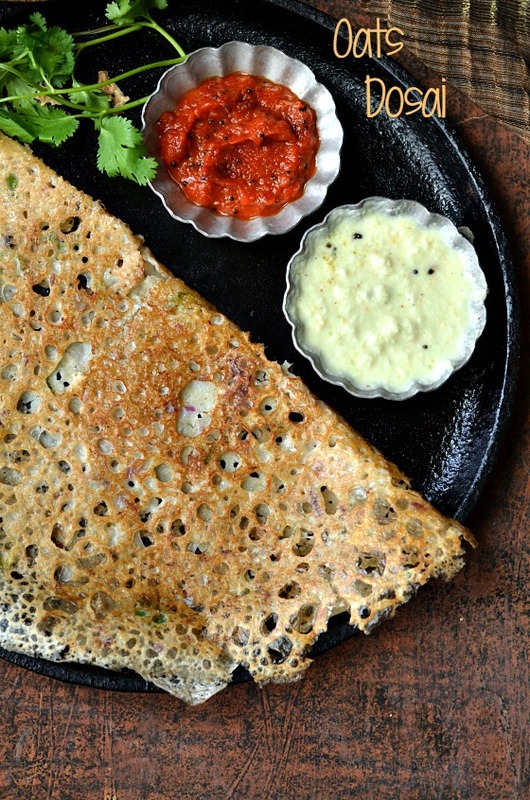 That lacy dosai is calling my name. I am ready to invite myself over to your place Nalini! Another interesting dosa you got there!!! Pretty and healthy. Wow. Wish I could wolf whistle. This is yum Nalini. 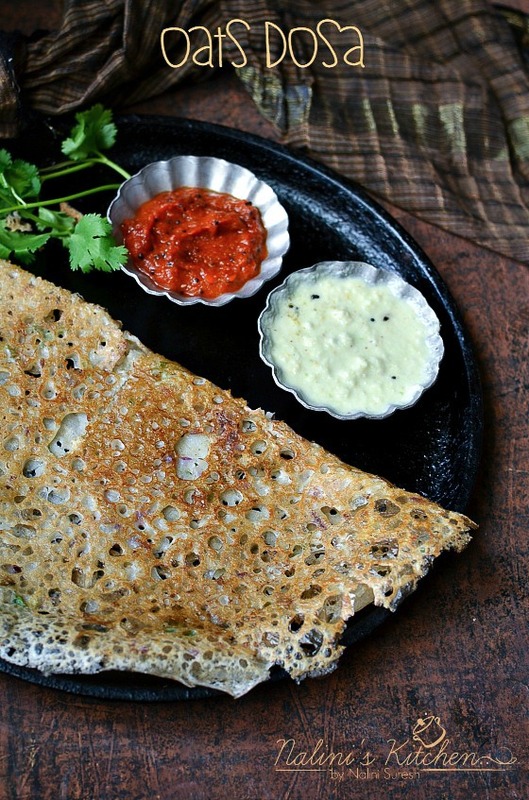 Oats dosa look sooo lacey and delicious. It looks like my favorite onion rava dosa. Yum!! Lacey, crispy dosa!!! Perfect with all those accompaniments!! I would have never imagined dosa with oats. looks so crispy. OMG that lacy texture is amazing Nalini, can have a feast with this..very nice..